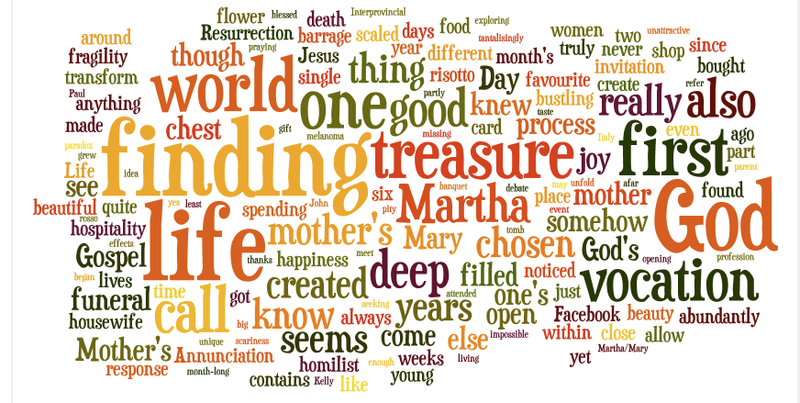 Last week I was experimenting with Wordle, and used my RSS feed to supply the words. My friend Cloister then kindly used her trusty Mac to turn the result into a photo, so I could post it here. 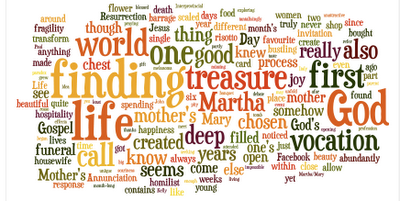 But for anyone who loves words a Wordle is a thing of beauty, a kind of visual poetry. Its sheer randomness throws up some lovely combinations and juxtapositions: "finding treasure"; "transform fragility"; "Resurrection" before "death" (with blessed in between); "lives" above "funeral"; "beauty" and "abundantly" beneath "vocation" and so on. And then there is the mundane and the everyday; ordinary, easily passed-over words are part of the beauty - and, as a friend commented when I first posted it on Facebook "glad to see that risotto has a place!" This is fun!! I love the new spin it gives the words...wiggle room to re-sift, find new places to bloom and create beauty.